(*Picture is of the prototype model and does not include all detail.) The legendary Bucyrus-Erie company is known around the world. From the Panama Canal to the largest dragline ever built ("Big Muskie"). 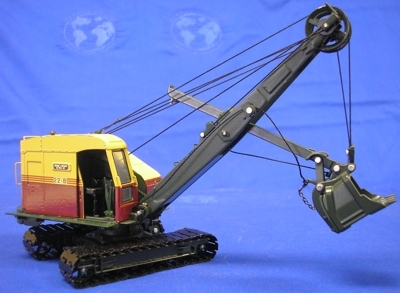 Bucyrus also had divisions in other countries including Ruston-Bucyrus in the United Kingdom and Komatsu-Bucyrus in Japan. The legendary machines of this company are now being brought to life in miniature by EMD - Engineering Model Developments. Many of us drove by these working on construction and road building sites when we were young. Now is your chance to collect a series of these amazing machines in exacting detail. A line of shovels, cranes, draglines, clams, cranes and transit machines. Some of the models which will be available soon include the 10-B, 15-B, 22-B, 30-B, 71-B, 88-B, 190-B, 280-B, 295-B and the 20-H. This is the introductory list and may change. The models will be available in three different scales depending on the machines. The scales will be 1:25, 1:50 and 1:87. (Literature excerpt from Bulletin 61-B-1) The first model will be the 22-B shovel. This machine was used for digging in quarries, building roads, trenching and lifting. 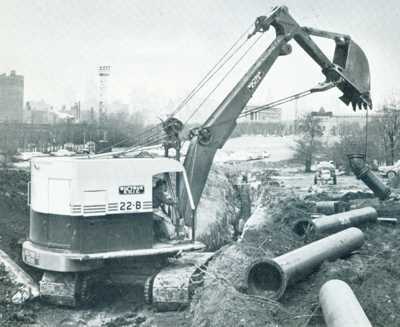 They were available as cable shovels, cable hoes, draglines and cranes as both crawler mounted machines and "Transit Machines" which were truck mounted. This model is in 1:50 scale. Bookmark this site to see the releases of all the great upcoming new models.